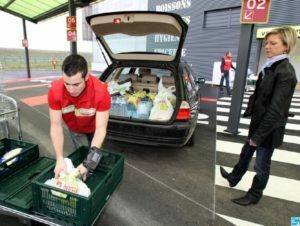 France’s food retailers are successfully developing a drive-through version of ‘click and collect’ shopping which may be vital to help them to defend market share and maintain profitability, says Scope Ratings agency. The accelerating roll-out of ‘dark stores’ – hubs where shoppers drive to pick up their online orders – by the likes of E.Leclerc, Auchan SA, Carrefour SA and Groupe Casino SA comes as footfall at hypermarkets continues to decline and customer appetite grows for online services. E.Leclerc is the market leader in the segment which for now makes up only 5.5% of food retailers’ sales in France. “The rapid development of the likes of AuchanDrive and CarrefourDrive shows how French food retailers have had to adapt their online sales channel to the country’s geography, marked by less densely populated regions outside of the main cities,” says Adrien Guerin, analyst at Scope. In contrast, the UK’s higher population density and higher receptiveness of e-commerce makes the country more suitable to home delivery. Online sales make up around 6-10% of the total at Tesco PLC and J Sainsbury PLC compared with 1% at Carrefour. “The drive-through version of ‘click and collect’ will shore up profit margins of French food retailers at least in their domestic market at a challenging time for the sector at large,” says Guerin. The drive, click and collect model has several commercial and financial advantages for the retailers. Customers, not retailers, bear the ‘last-mile’ delivery costs, while the channel is a good way for retailers to promote own-brand goods. “Dark stores are also cheaper to set up and run than supermarkets, reducing the retailers’ capital costs and operating expenses considering the stores don’t have to be designed to attract shoppers because the product management is out of sight of the consumer,” says Guerin. Growth in the hybrid sales channel is not without its own risks. One is that the retailers’ ‘drive’ offering is more limited than a normal hypermarket’s, leading to less choice of goods and more uniform prices, as well as less room for ‘impulse’ buying. Cannibalisation remains a risk, particularly if growth in the “drive” channel accelerates the drift away from hypermarket shopping too sharply.